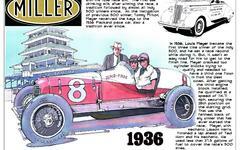 This is a large collection of articles concerning the 1911 Indianapolis 500. This content covers practice and preparation for the event, many featuring the star drivers such as eventual winner Ray Harroun, Ralph Mulford, Bob Burman and Ralph DePlama. Barney Oldfield, who was banned by the AAA during this period and missed the first Indianapolis 500, wrote a racing column and several of his contributions are contained in this folder. Complete race day coverage is yet to be added, but will be included them in the future. Hot shoe Lewis Strang, still stinging from his heartbreaking divorce from stage actress Louise Alexander, had been approached by the Case Company in 1910 to prepare a race team for the 1911 season. This articles shares plans and preparations of the Indianapolis Motor Speedway for practice, time trials and the first Indianapolis 500. It discusses how officials, after breaking from a conference, announced that time trials would be held Friday, May 26. The article was published May 12, 1911. This package contains two articles. The first is an overview of the men and machines entered up to that point (May 7, 1911) and the second is a regularly appearing column written by the top showman of all drivers, Barney Oldfield. Oldfield was suspended from the AAA in 1910 for organizing racing events outside AAA sanction. Specifically, he staged a race with then heavyweight boxing champion of the world, Jack Johnson. One of the big problems was that Johnson was black. In a racist society the pugilist was villified simply for being successful. This brief article focuses on the National Motor Vehicle Company team and their work during practice for the first Indianapolis Motor Speedway. This article focuses on the entry of Harry Endicott (brother of Bill Endicott) in the Muncie Company's Inter-State racer. The article was published May 23, 1911. This package includes another of Barney Oldfield's columns and a preview story on Indianapolis Motor Speedway preparations for the first Indianapolis 500. In the preview story there is substantive discussion of Ray Harroun and the Marmon Wasp. His rear view mirror is jokingly referred to as a "dumb mechanic always looking backward and always on the job." A sidebar story talks about Harroun's plans to become an instructor at the country's first aviation school. Oldfield's column discusses how activities in America spurred European manufacturers to return to a focus on auto racing.